Solid'Ayiti - Promoting self-sufficiency, independence, social justice and peace in Haiti. 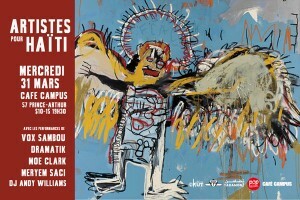 Tune-in for a Montreal radio broadcast launch of the recently released “Democracy in Haiti” mixtape live on CKUT community radio. Featuring interviews with Haitian hip-hop artists Vox Sambou & Diegal Leger (Rawgged MC) and also filmmakers Magee McIlvaine & Lena Jackson currently finalizing a documentary film “Democracy in Haiti” on grassroots Haitian struggles. Interviews will focus both on the recently released mixtape, via Nomadic Wax in New York City, but also on the process of creating the “Democracy in Haiti” documentary film. 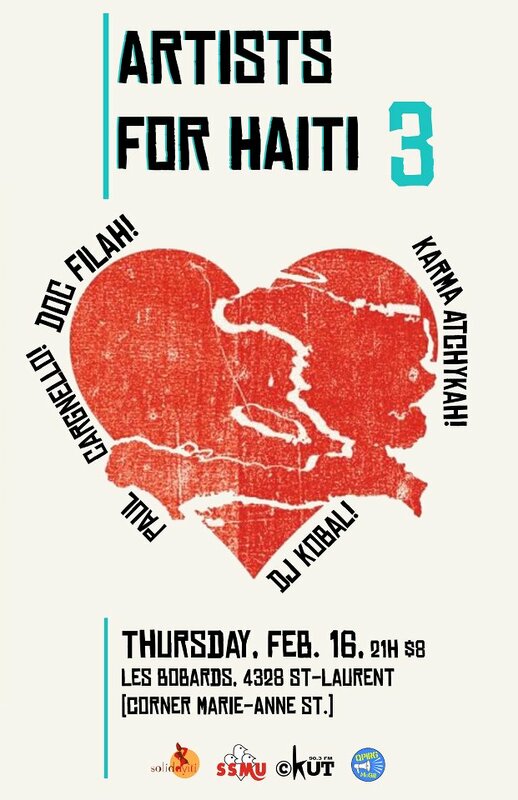 For the Montreal broadcast launch for “Democracy in Haiti” CKUT radio, we will feature tracks from the compilation but also other Haitian musical sounds, hip-hop and beyond, projecting the diverse sounds of progressive Haitian musical culture. This Montreal broadcast launch of “Democracy in Haiti” will air as a special edition of “World Skip the Beat” on Monday, May 2nd in Montreal in collaboration with Nomadic Wax and the Montreal-based collective Solid’Ayiti. Also joining the program is author and activist Yves Engler speaking Canadian interference in Haiti dating back to the 2004 coup d’état against popular Haitian political leader Jean-Bertrand Aristide and recent reports on Canadian interference in post-earthquake Haiti. Serving as the sister project to the upcoming Nomadic Wax documentary film, “Democracy in Haiti,” the Democracy in Haiti Mixtape highlights the political, cultural and social issues facing Haitian youth after the earthquake that struck the country in January 2010. The third film in the “Democracy In …” series, “Democracy in Haiti” presents to audiences Haitian youth who have been active in the rebuilding of their country. In Haiti the youth make up the largest percentage of the population, yet, their voice is often ignored in discussions of political importance. 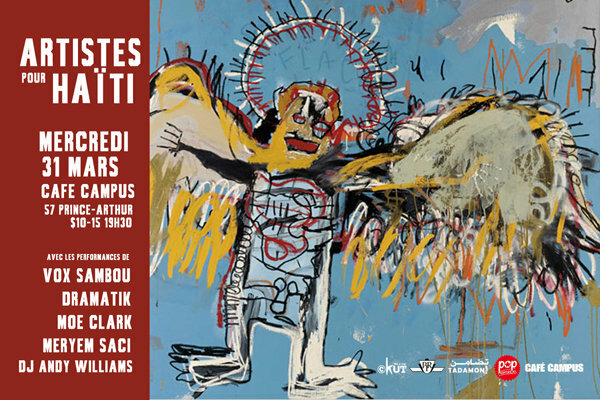 Serving as an outlet for Haitian youth to bring forth their voice, “Democracy in Haiti” spotlights several young artists who have taken active roles in the reformation of Haiti’s cultural and political stature. Lena Jackson, the Nomadic Wax Director of Photography for the “Democracy in Haiti” film, recently returned to the country to document the events of the second round presidential elections and further capture the voice of Haitian youth on film. “Democracy in Haiti” helps audiences understand the important role Haitian youth must play in the foundation of Haiti’s political and social future. Featuring talent from Haiti and the Haitian Diaspora around the world, the Democracy in Haiti Mixtape brings together a diverse group of hip-hop artists contributing verses that emphasize the socio-political issues currently facing Haitian society. As the audio backdrop to the “Democracy in Haiti” film, the Democracy in Haiti Mixtape encourages Haitian youth to stand up and take part in the successful rebuilding of their nation’s society. The Democracy in Haiti Mixtape is mixed by DJ Nio of Zero Plastica and produced by Magee McIlvaine of Nomadic Wax, Vox Sambou and DJ Nio. Mastered and engineered by Dan Cantor of Notable Productions. 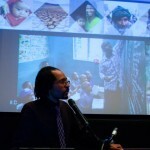 visit http://www.democracyinhaiti.com/ to learn more about the “Democracy in Haiti” film. An interesting article in the Guardian on Haiti & the U.N. force occupation. 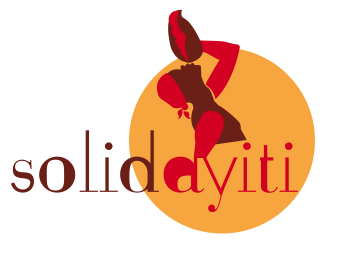 Thank you to everyone who attended the Solid’Ayiti panel discussion on Dec.. Huge thanks to Mr. Jean St-Vil and his utterly incredible presentation on Haitian history & education, Nantali Ondongo and Vox Sambou for their observations and analysis on hip hop and education in Haiti. Thank you Diegal Leger for moderating. Special thanks to Jose Garcia and Citizenshift for the live webcast and archive of the videocast below. Please scroll to 20min into the video to start watching our discussion. Jean Saint-Vil’s presentation starts at 38 min. Special thanks to Khalil Allioui for photographing the event. As Haiti approaches the one year anniversary of the devastating earthquake that struck Port-au-Prince last winter, Solid’Ayiti invites you to a panel discussion at Concordia University in Montreal that will focus on the struggle to build and support accessible public education in Haiti.